Squirrel has been ever present as of late, making chucking noises and happily bounding across the yard. As I sit at the window watching them intently searching for acorns, my thoughts turn to what this cheerful little creature has to share with us. Here is what it may mean if you feel called to discover Squirrel as a Spirit Animal. Winter is coming - and the Squirrel intuitively knows it. Months ahead, they begin planning and making their preparations for shelter and food stores for the long winter ahead. Squirrel teaches us to always be prepared. To think ahead. To gather your resources. What do you have now, what tools do you have at your disposal, that you can save for a rainy day? Maybe now is the time to save more money or invest in your education. What is an old skill that you can repurpose and use in a new way? You never know how what you already have in your repertoire will come in handy! Squirrel is always on the look out for predators - he has to be. He also has to be crafty and cunning in how he avoids these dangers. Squirrel invites you to make a plan B so that you're not blindsided by the unexpected. Squirrel knows it is better to climb to the tree tops for safety. This way he can get a bird's eye view of the situation and maneuver accordingly. Friendly and not afraid to let you know how they feel, squirrels are some of the most resourceful creatures out there! Squirrel may be telling you it's time to survey your resources. What do you have? What can you share with others? Having a Squirrel animal totem also encourages you to be curious and to make new friends! Chat it up. This creature also reminds us that sometimes it's okay to be bit nutty. It's okay to be passionate and to express your pleasure or lack thereof. Squirrel isn't afraid to do a little digging! 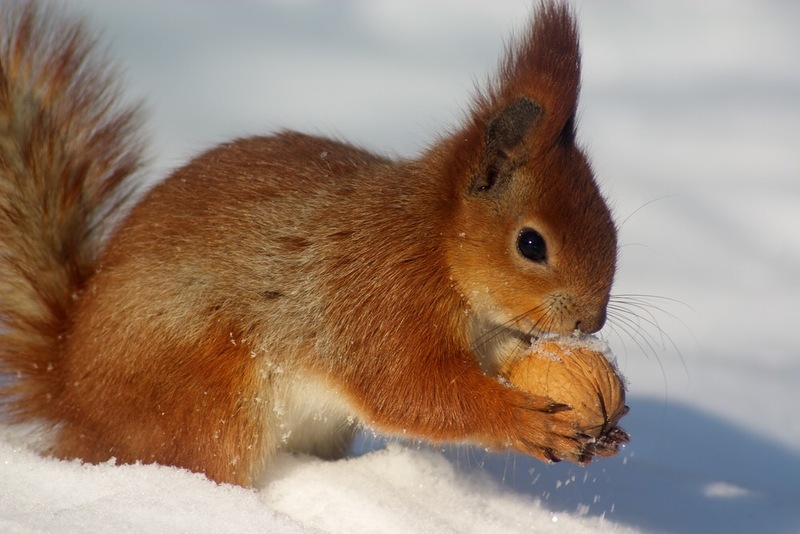 With such a short attention span, squirrels forget where they buried their nuts within seconds. This actually turns out to be a good thing as although forgotten, these acorns have been given a chance to germinate, grow, and sprout new life. Squirrel encourages you to recycle, plant a tree or garden, donate your money or time to worth environmental causes. Squirrel also reminds us to live in an environmentally friendly and ethical way. When his acorns mature into trees, his energetic footprint provides oxygen for generations - long after Squirrel is gone. What kind of footprint do you leave on Mother Earth? Squirrel is a small creature that may often be overlooked but his message packs a powerful punch. Don't you think?